London has given Moscow until the end of Tuesday to explain the use of a military-grade nerve agent for the poisoning in England of Russian former double agent Sergei Skripal and his daughter Yulia. 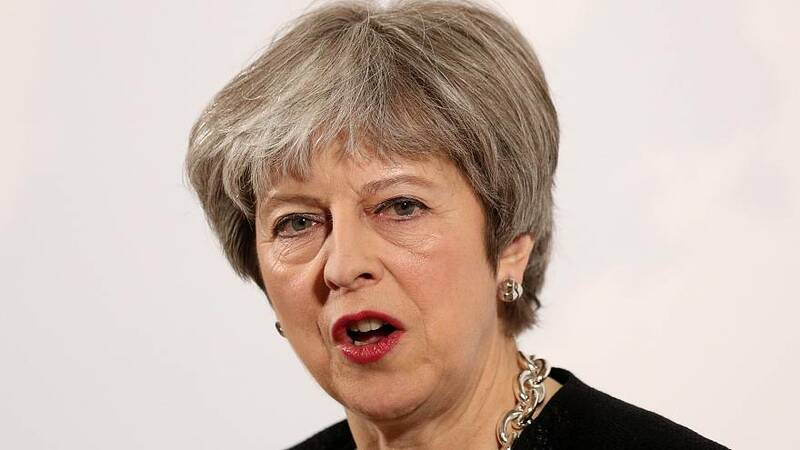 On Monday Prime Minister Theresa May said it was "highly likely" that Russia was to blame, after Britain identified the substance as a type of nerve agent developed by the Soviet military. Russia's foreign minister has flatly denied that his country was involved in the case. "We've made a statement to dismiss this as nonsense. We have nothing to do with this," Sergei Lavrov said on Tuesday. He said the British government had refused to provide Moscow access to materials related to the poison attack, TASS reported. British Foreign Secretary Boris Johnson has described as encouraging the strength of support for the UK over the case. US President Donald Trump said on Tuesday he planned to talk to Theresa May later in the day. "It sounds to me that it would be Russia based on all the evidence they have," he told reporters. "As soon as we get the facts straight, if we agree with them, we will condemn Russia or whoever it may be." Earlier – before he was sacked by Trump – US Secretary of State Rex Tillerson said the United States had "full confidence" in Britain's assessment that Russia was likely responsible. On Tuesday the European Union said it would stand by Britain over the nerve agent attack. "We are very much concerned with the situation, also the findings the UK has so far," European Commission Vice President Valdis Combrovskis told reporters when asked if the EU might back action against Russia over the case. "Of course the UK can count on EU solidarity in this regard," he added. The head of the Organisation for the Prohibition of Chemical Weapons (OPCW) has condemned the use of a chemical agent in the attack last week. 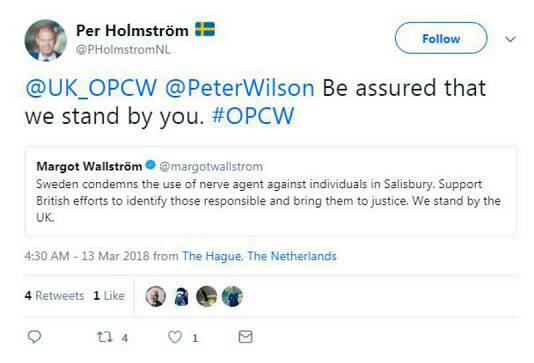 Director General Ahmet Uzumcu said those responsible "must be held accountable", according to the UK's ambassador to the Netherlands and OPCW representative Peter Wilson. Britain has identified the substance used as part of the highly-lethal Novichok group of nerve agents developed by the Soviet military in the 1970s and 1980s. However, a former senior official with Russia's foreign military intelligence agency (GRU) has told Euronews that the UK has no proof that Moscow is behind the Skripals' poisoning. Vladimir Koshelev, who says he personally knew the ex-spy, said Sergei Skripal posed no threat to Russia. He added that Moscow had fulfulled its international obligations for eliminating chemical weapons following the demise of the Soviet Union. Instead he suggested that other states such as Ukraine could have been responsible. Referring to intelligence services "friendly" to Britain, he hypothesised that "another country that used to be part of the USSR - where warehouses with these weapons were also located, for example Ukraine", might have been happy to work with British intelligence services "just to make harm to the Russian Federation". The British prime minister told MPs on Monday it was "highly likely" that Russia was behind an attempted assassination of the former spy in southern England, adding that Britain would deem it an unlawful use of force on its territory if Russian authorities failed to provide a credible explanation by Tuesday evening. In a statement to Parliament in Westminster, she said: "Either this was a direct act by the Russian state against our country, or the Russian government lost control of its potentially, catastrophically damaging nerve agent and allowed it to get into the hands of others." She added that Britain was preparing to take "extensive measures" against Russia. Russia's ambassador to London has been summoned to explain to British Foreign Secretary Boris Johnson how the nerve agent came to have been used. Russia's Interfax news agency has reported that the UK's ambassador in Moscow has been summoned to the Russian Foreign Ministry. Retired military intelligence officer Sergei Skripal, 66, and his daughter Yulia, 33, were found slumped and unresponsive on a bench in Salisbury on 4 March. Tests later revealed they had been poisoned by a “military-grade nerve agent of a type developed by Russia," May said in her statement. The pair remain in critical but stable condition. A policeman, Detective Sergeant Nick Bailey, remains seriously ill after attending to them. Investigators have since cordoned off swathes of Salisbury town centre in an effort to trace the source of the toxic substance and ensure the area is safe. At least 21 people, including officers that attended the scene, have been treated for exposure in hospital since the incident unfolded. Theresa May's statement on Monday implicating Russia was given short shrift by the Russian authorities. Russian Foreign Ministry spokeswoman Maria Zakharova dismissed the Prime Minister's speech as "a circus show in the British parliament". She told the TASS news agency: "The conclusion is obvious: It's another political information campaign, based on a provocation." The ministry tweeted a video ridiculing May's comments by suggesting Russia might also be blamed for the recent bout of snow to hit Britain. The Russian embassy in Washington described it as "another stance of fake news". "Baseless accusations of any imaginable sins apportioned to Russia continue multiplying," said the spokesperson. "Yet another fake story was circulated on Monday. It claimed the presence of a Russian trace in the tragic events in the UK." "At present, however, there isn't a single evidence to support the correctness of the British - and now the American - authorities' conclusions," he added. White House spokeswoman Sarah Sanders said on Monday that the United States stood by America's "closest ally", but she stopped short of blaming Russia for the attack - despite repeatedly being pressed on Moscow's alleged involvement. A UK public inquiry concluded in 2016 that he had been killed by Russia's security service, probably under the orders of President Vladimir Putin. Litvinenko's widow Marina has said that the UK should respond to the poisoning of the Skripals by sanctioning individuals suspected of committing crimes abroad.